The National Oceanic and Atmospheric Administration (NOAA) confirms that 2012 was the hottest year on record for the lower 48 states. Not only did the continental US experience an extremely severe drought, but it was also plagued by wildfires, hurricanes and storms. Tornado activity, however, was below average. According to the NOAA and the National Climatic Data Center (NCDC), 2012′s average temperature was 55.3 degrees Fahrenheit, 3.2 degrees above the 20th century’s average and 1.5 degrees above the average in 2011. This year’s average temperature was only one degree above the average temperature of 1998. Though a one degree increase seems marginal, it is actually the opposite: annual temperature records are usually only broken by tenths of a degree. Average temperatures in earlier years had remained within a range of 4 degrees; thus, making 2012′s jump fairly grim. The year 2012 contained the fourth-warmest winter, warmest spring, second-warmest summer and above-average temperatures in fall. This past July, 61% of the country experienced drought conditions, and was the hottest month for the contiguous 48 US with an average temperature of 3.6°F, exceeding typical July temperatures. 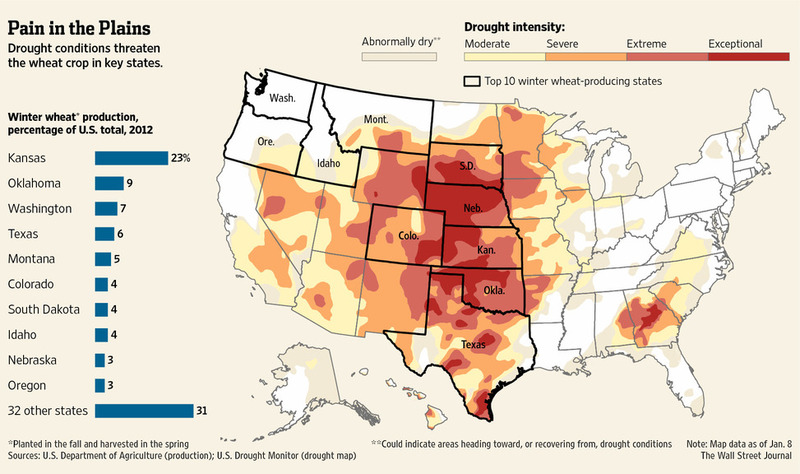 The drought spanning 2011-12 has had a relentless impact on farms, and caused $35 million loss in crops alone. The drought was provoked by low snow cover and warm temperatures during winter 2011, and continuing exacerbation by record warmth during spring 2011. Though a warmer spring allowed for the growing season to begin early, soil moisture was exhausted sooner than expected. A March heatwave kicked the drought up a notch, expediting the growth en masse, particularly across the Plains and Midwest. Perhaps the NOAA’s findings will push Congress and the White House to target greenhouse gas emissions, which surely have had a hand in the world’s ever-growing climate change. The White House is gearing towards putting a cap on greenhouse gas emissions for power plants, a major source of emissions. US emissions are still high — and though they have been reduced this year through the use of natural gases, renewable energy for electricity, and fuel-efficient cars — there’s still more to be done. Dr. Das recently tweeted a letter to President Obama by the MIT Technology Review called, “Dear Mr. President: Time to Deal with Climate Change.” In this letter, the editors argue that addressing climate change must take top priority in the next four years. However, the political reality in Obama’s second term is that lawmakers are divided and polarized in both Washington and state capitals, and other pressing issues will direct the nation’s attention, such as the economy — jobs, fiscal cliff, revenue, taxes, deficit and debt — immigration, and gun violence. Once again, the energy and environmental policies, and climate change debate will unfortunately take a backseat until the mid-term election in 2014. It’s anybody’s guess as to what will happen in 2015. CNN recently published a chart, mapping global food waste from origination to disposal. Gleaned from this chart are the great food losses amassed by both developed and developing countries, and the improper management and conservation of energy and food sources. Though the world is eager to discuss sustainability, green culture and climate change, it seems that food waste is an often untouched topic; yet, one cannot turn a blind eye to CNN’s statistics. According to CNN, one-third of food produced is lost or wasted globally, a total of 1.3 billion tons per year. Also according to CNN’s chart, food waste in industrialized countries — 222 million tons — is almost equal to the net food production — 230 million tons — in sub-Saharan Africa. That statistic sheds light on how the world unknowingly wastes vast amounts of food because there are no proper management systems in place. Many of these countries don’t blink twice over food losses; developed countries, like the US, take its food access for granted, while developing countries have continually diminished access. One would think that since the US is experiencing an economic recession and increased food inflation, it would try to gain control of any food loss; however, that is surely not the case. According to the original source for CNN’s chart, 10% of the US energy budget is used to transport food from farms to households, using 50% of US land and consuming 80% of US freshwater resources. However, 40% of food in the US remains uneaten, which is over 20 pounds of food per person, per month. Americans are unnecessarily wasting $165 billion per year, just on food and water losses alone. Although we are a world obsessed with green culture and recycling, 3% of food waste is currently recycled. Additionally, 40% of landfill content comes from food waste — uneaten food is going straight into the garbage. As discussed in previous entries – “Milk Price Fight Boils Over” and “Time Is Running Out to Pass a Farm Bill in 2012″ — US food prices may very well skyrocket due to our country’s indecisive lawmakers. If we are able to properly manage and conserve our food supply, and increase efficiency in our food system and use of natural resources, then we might be able to save ourselves money and food, while also meeting the growing food demand. Additionally, eating less and eating locally grown food (and thereby wasting less and lowering transportation carbon foot print) promotes a happier and healthier lifestyle, while also lowering personal and societal medical costs. This year, the US experienced its worst drought in over 50 years, destroying corn and soybean crops across the Corn Belt. Surprisingly, regardless of the drought, farmers are continuing to invest more in planting. Taking advantage of low interest rates, farmers are snatching up land, rather than investing in stocks and bonds. Even in our tough economy, farmland prices – with the exception of the recession in 2008 – have doubled since 2005. Banks are worried that the same thing that jumpstarted the recession will occur with farmland to create a “farmland bubble”. But such a bubble is far from farmers’ worries; farmers are more concerned about growing their businesses so they can produce more crops and increase their income. Rather than buying stocks or leaving their money in the bank, many farmers feel that investing money in farmland is more practical. The demand for farmland is high, which has caused some banks to worry that farmers will make poor choices. Such was the case in the 1970s and 80s, when many farmers were piling up more debt to acquire more land, and using their farms as collateral. The debt inevitably left many farms in ruin and led to sinking land values. The drought has caused a surge in soybean and corn prices, probably a main factor in the farmland boom. The Department of Agriculture has reported that the likely net farm income for 2012 is $122 billion, a 4% rise from the $117 billion in 2011, the record net income level since 1973. Farmers have less debt then 30 years ago. Low interest rates also make borrowing less expensive, which can be helpful for farmers; but farmers might be in trouble if interest rates rise and crop prices fall. The question to answer: since farmers have continued to invest in land, will we see a reemergence of plummeting land values? And what happens if, in 2013, farmers have to suffer through another drought? Droughts can severely affect the lives of farm animals; livestock are often slaughtered if their living costs increase too rapidly. Farmers look at the situation economically, and sometimes selling an entire outfit makes more sense than continuing to run the show. According to the National Climatic Data Center, 2012 has been the hottest year on record. Our summer was unfailingly warm; since June, corn prices have grown 41%, while soybean prices have grown 33%. On the same note, prices for hogs and cattle have dropped 19% and 8%. There is a rise in the slaughter rate – the rate for hogs has shot up to 16%, when, at this time of year, the rate is usually 4-6%. The drought has raised livestock feed prices, persuading farmers to liquidate their assets. In late 2007 and mid-2008, grain doubled in price, which pushed farmers into thinning their herds. The monthly average of slaughtered hogs increased to 10 million, from a steady rate of 8-9 million. However, the price of hogs recuperated in 2010-11. The question to answer: how will our hand in climate change continue to affect the cost of food?